First and foremost, it’s important to understand that the island of Ireland is not a single country. The island is divided into two parts, the Republic of Ireland and Northern Ireland. There’s a long and confusing history riddled in conflict between the Irish and the British Crown that eventually led to the Government of Ireland Act of 1920 resulting in the Partition of Ireland meaning Ireland became a free state aside from the Irish province of Ulster (Northern Ireland) which would remain in a union with the UK and thus forming the border dividing the island. The decision for Ulster to remain united with England ultimately came about by its population, which had been for the most part comprised of British and Scottish protestant settlers who did not wish to separate UK. Although more people in Northern Ireland view themselves as British and wish to remain in a union with the UK, there are nearly just as many people who identify as being Irish and who’d like for nothing more to form a unified Ireland separate from British rule. These conflicting desires within NI have been the foundation of decades of violence, which the people of Northern Ireland often refer to as ‘the Troubles’. My semester abroad was focused on these violent times and what’s currently being done to propel to peace process forward, as well. 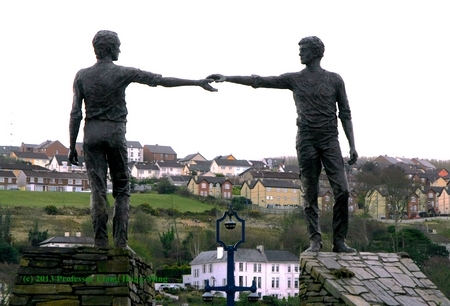 Located in Derry/Londonderry Northern Ireland, this monument is representative of the peace process, the people of Ulster ‘reaching across the divide’ and moving past differences. I think this divide is very interesting. There will never be clear cut borders. Humans are all different and all have different needs and wants. This becomes even more evident when countries have this divide. Violence has and always will occur because of differences, however I believe we need to look past that and try to find a peaceful solution. I know that is hard, especially is other people are acting violent. However, I think it is interesting the divide between human beings and our differences. Borders are a nuisance when it comes to one’s identity but then again, I can’t imagine a world where borders didn’t work to one’s advantage. It seems that this situation between the two parties is focused more so on the differences than similarities. I was so interested to read this article since I myself studied abroad in Ireland this past Spring. I was shocked to learn about the time of troubles, an time for the Irish fighting for their independence and basic human rights that is not hardly (if ever) mentioned in history classes in the USA. Northern Ireland saw massive amounts of blood and bombs, and managed to recover to a beautiful and culturally rich nation. Bloody Sunday was one of the horrific events of the plight of the Northern Irish people for basic human rights in the 1970’s. Twenty-six unarmed civilians were shot that day in protest against government internment. It’s great to see this information and history being formed into a conversation here. This was very interesting for me to read since I personally studied abroad in Ireland this Spring. The Time of Troubles were shocking to learn about since it had never been mentioned in any of my previous history classes. Northern Ireland posses rich and saddening history that reminds us all of the blood that was shed for their human rights. In 1972 twenty-six innocent civilians were shot during a peaceful protest again internment; the day which is now referred to as Bloody Sunday. Please visit Ireland and Northern Ireland for those of you who have not yet to experience their beautiful and difficult history.